I am a really big fan of art made from stainless steel, particularly in the field of the miscellaneous arts. 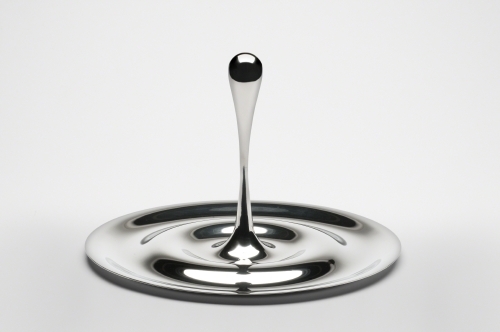 Stainless steel tableware started being made early in the 1900s. At this time, Bauhaus (1919–1933, Weimar, Dessau, Berlin) artists applied industrial materials to utilitarian objects in artistic ways. The following stainless steel objects are so beautiful, and I can totally see them as props in the new Star Trek series, Star Trek: Discovery! I thought it would be fun to contrast these beauties with more traditional examples. The biggest boom in Postmodern design came in the 1980s. Pierangelo Caramia is an architect and designer. He graduated from the University of Florence in 1984 and the Domus Academy in Milan in 1986, so I’ll call his style NeoNeoclassicism. The lines are so incredibly clean and elegant, it’s hard not to associate it with classical simplicity. 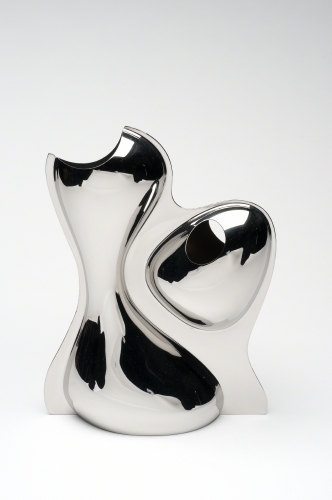 While the form brilliantly imitates a bird, the piece totally emphasizes the beauty of the material. Caramia is an architect who lives and works in Paris. His historicism is not confined to utilitarian objects, for he has restored buildings dating from the 1100s to the 1600s. He also teaches at the Academy of Modern Art in Paris. 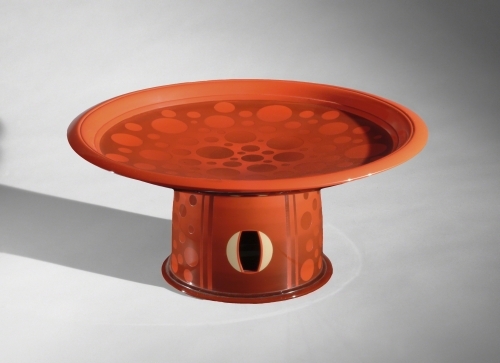 In the past decade, he has designed objects of terra cotta that resemble finds from archeological digs. The teapot in this painting is most likely unglazed stoneware. It has a certain streamlined quality that complements Caramia’s, I think (except for the wicker handle). Shibata Zeshin is famous as a master of the ancient art of lacquer, which he perfected for painting. Still life was not a prevalent subject in Japanese art, as it was in Western art starting with the Renaissance. 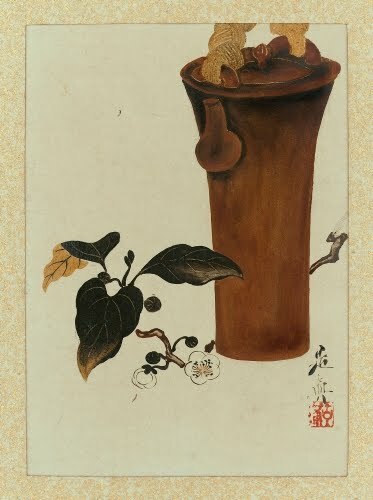 Still life depictions such as this appeared in the late 1700s in the work of such artists as Katsushika Hokusai (1760–1849). They may have been influenced by Western art, but it is more likely that such depictions descended from the kachō-ga, or "bird-and-flower painting." This genre, influenced by Chinese examples as early as the Kamakura Period (1185–1333), became very broadly defined in Japan, encompassing flowers, birds, insects, frogs, fish, pets, etc. That genre featured a single branch or flower with one or two birds on the blank background. This still life by Shibata contains the same aesthetic. This piece is just so gorgeous and it reminds me of Harold Edgerton’s (1903–1990) Milk Drop photograph. Gijs Bakker was trained as a jeweler and industrial designer at the Rietveld Academie in Amsterdam and the Konstfackskolan in Stockholm. His groundbreaking jewelry designs in the late 1960s caused a sensation, and became symbols of the “mod” revolution in fashion design. Since that time, he has continued to produce daring designs in jewelry, appliances, furniture, and interiors. He was a co-founder of the Droog Design group in 1993, and in 1996 he co-founded the secessionist jewelry designer group Chi ha paura…? (Italian for Who’s afraid of…?). chp…?, as it is now known, invites avant-garde jewelry designers to create special pieces for their collection, exploring the idea that jewelry is a stand-alone art more than a fashion accessory. View more of his designs on gijsbakker.com. Lacquer has played an important part in Japanese culture as a protective, decorative finish for items made from leather, wood, paper, bamboo, and metal for more than two thousand years. Japanese lacquer is harvested from the sap of the lacquer tree (Rhus verniciflua). It is applied to an object with a brush or spatula. Lacquer hardens to a waterproof finish in a controlled environment of high humidity and temperature. This gorgeous bubble-motif fruit stand was created in the ages-old lacquer tradition by Mori Miki. He was trained in the traditional fashion by apprenticing to lacquer master Shigehiro Sanju I (died 1922). He adopted his master’s name as Sanju II. After studying further with Asobe Sekisai, he became an independent lacquer artist in Tokyo. This dish is called a moriki, or tray for seasonal fruit. It was made in the kanshitsu technique in which pieces of hemp soaked in lacquer are place around a wooden or clay mold, which is removed after the lacquer hardens. This pitcher (which translates as “your pitcher”) is a remarkably sleek, timeless design that so reflects Mario Botta’s experience with the great masters of the International Style, Le Corbusier (1887–1965) and Louis Kahn (1901–1974). The form definitely follows the function without ornament! Botta attended the University Iuav in Venice, the first architectural school in Italy that also focuses on design. This piece could easily be mistaken for a Bauhaus design of 75 years earlier. His architectural designs emphasize the simplicity (and severity) of the underlying forms, often with a sheath of bricks. He opened his own practice in Mendrisio, Ticino in 1969. In 1996, he founded the architecture program at the University of Italian Switzerland in Lugano, of which he became dean. Korea, Goryeo Kingdom (918–1392 CE), Pitcher, 1100s–1200s. Bronze, 9 13/16" x 8 13/16" (25 x 22.5 cm). © Brooklyn Museum. (BMA-4996). This sophisticated bronze pitcher may put one in mind of the gorgeous bronzes from Shang (ca. 1523–1028 BCE) and Xhou (1027–256 BCE) China. That’s a good connection to make, because during the Goryeo period, Korea was heavily influenced by China. 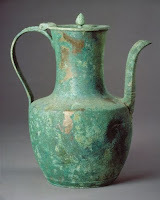 Bronze casting was probably introduced to the Korean peninsula from China during the first 1000 years BCE. The Goryeo dynasty established a unified kingdom on the Korean peninsula after defeating the Later Koguryo kingdom (918 CE), the kingdom of Silla (935 CE), and the Later Paekche kingdom (936 CE). The Goryeo period is characterized by its highly refined ceramics and bronze work. Like Chinese bronzes, Korean examples were based on earlier ceramic forms, but Korean bronzes lack the complex surface ornamentation of the Chinese. Ron Arad’s design work has been characterized by an adventurous use of unusual materials since the early 1980s. 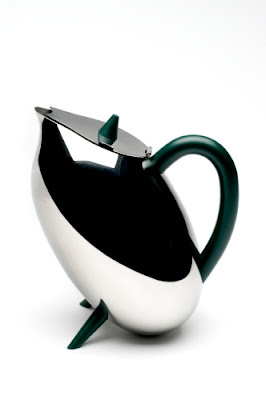 His designs are also renowned for the unusual forms he creates in commonplace objects. This vase is certainly a non-conformist design for a millennia-old form. Arad, born in Tel Aviv, studied at the Bezalel Academy of Art and Design in Jerusalem and the Architectural Association in London. He established his own design and production company, One-Off, in 1981. That same year he produced his famous Rover chairs and settees, which united car seats from junkyard Rover 200s with construction scaffolding pipes. In 1994, he established Ron Arad Studio in Como, Italy. During the 1990s he experimented with a wide range of unusual materials for utilitarian objects, such as steel, aluminum, or polyamide. It was during the 1990s that Arad perfected various methods of working with steel, including welding, beating, and forging. 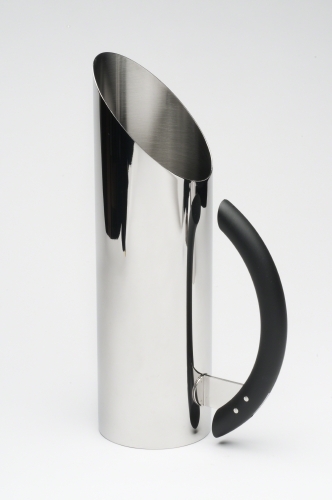 Despite the organic form of this vase, the use of stainless steel gives it a singularly simple classical, yet contemporary, aesthetic. Having two apertures, it is made by welding together two sheets of stainless steel. We round out our exploration of “What’s New Is Old” with a vase that could easily pass for modern. I’m pretty use such a vessel wasn’t used to display flowers, but it is so elegant and streamlined. The early agricultural, fishing, and herding cultures in Egypt seem to have laid the groundwork for later cultural customs as early as 5500 BCE. The Badarian culture is named after the area El-Badari, Asyut, which is in Upper Egypt. It is the earliest known non-nomadic culture in Egypt of the pre-dynastic period (dynasty one dates to 2920 BCE). At this point in Egyptian history, people were buried in shallow graves, often wrapped in papyrus mats, surrounded by objects that were perceived to be needed in the afterlife, such as vases like this filled with food. The bodies were usually buried in the fetal position, oriented north/south, but always with the face turned towards the West. In Egypt, the west—where the sun set—was considered the realm of the afterlife (eventually, where Osiris ruled). This clay vessel was most likely fired in an open pit kiln. 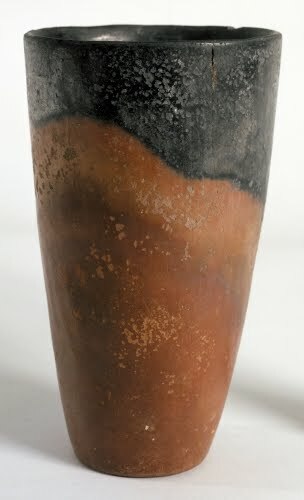 The black border, a typical feature of Badarian ceramics, is thought to be the result of turning the heated vessel upside down in finely cut hay or wheat (chaff). It is not glazed, but was burnished (polished with a hot stone). And This Is a Portrait of Whom?